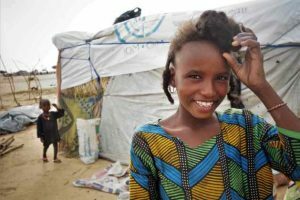 In 2015, the Boko Haram insurgency sweeping northern Nigeria reached the Diffa region of southern Niger, leading to the displacement of more than 250,000 people. However, even before 2015, Boko Haram had carried out some attacks in the region. In the wake of this crisis, people from across the border in Nigeria, and internally displaced people within Niger, sought refuge in Diffa town. What was, at first, an emergency slowly transitioned into a more permanent situation, and people have since made Diffa town their home. Lumo doesn’t know how old she is, but she believes she was born during the ‘dark wind’ — a year sometime in the early 1960s famous for a dark wind that engulfed the region. When famine hit back in 2005, she left her native Niger to look for better life opportunities in neighbouring Nigeria. Ten years later, together with her brother Tambaia, she decided to come back to Niger and settle in Diffa town. Lumo and Tambaia are two of almost 15,000 returnees living in the Diffa region right now.